A Midlands-based optometrist’s vigilance in spotting the signs of a double brain bleed helped save the life of retired resident, Michael Hannan. The 67-year-old man (pictured above, left) who is also diabetic, reported experiencing a sudden change in his vision which he described as being similar to a spider’s web coming across his eyes. He called the NHS 111 team, who recommended making an appointment with his local optician. 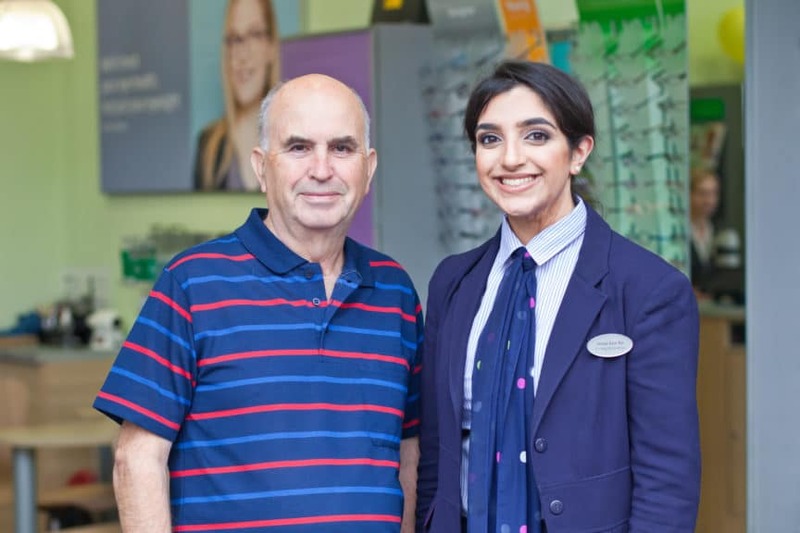 Mr Hannan’s daughter then made some calls to see who might have an appointment at short notice and Specsavers on the High Street in Brownhills was able to help. The eye test was carried out by optometrist Anoop Rai (pictured above, right) who was alerted to a problem that she thought needed further investigation. Mr Hannan’s doctor sent him straight to New Cross Hospital in Wolverhampton the same day. A scan revealed two bleeds on his brain, which needed an operation to repair. Following a four-day hospital stay, Mr Hannan was then transferred to the Queen Elizabeth Hospital in Birmingham. ‘I’d been taking aspirin so was told I would need to wait at least five days until it was out of my system before they could operate,’ says Mr Hannan. ‘I was booked in to have the first operation the following week which involved putting four holes in my head to fit two drains. It was three and a half hours before I came out of recovery and I stayed in hospital for three more days. As I live on my own, I had to be assessed to make sure I was able to look after myself before returning home. Specsavers in Brownhills delivers services for Diabetic Retinal Screening on behalf of the Heart of England Foundation Trust.